Wow, if this is true I bet Mary J is going down. She’s going down. She’s going doooooown, cuz you ain’t around. Her whole life turned upside down. Or something like that. Records are allegedly showing that between 2005 and 2007, Mary J received many shipments of HGH and anabolic steroids from an Orlando pharmacy. Orlando? I bet Mickey definitely has something to do with this. I heard he used to get all hyped up on steroids and then beat the mouse bag out of Minnie. I’m going to say that this story is probably not true and Mary J has probably not taken steroids. I’m not saying that it’s not true for any other reason then Mary J could beat the bag out of me with or without steroids. Oh, and she could do it drunk and/or high and with an eye patch and with one arm stuck in a bucket of cement….and half asleep….you know that REM sleep, not the full sleep. I am still a man after all. 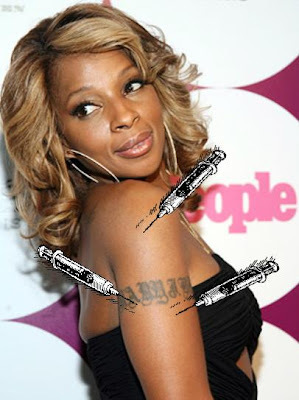 I couldn’t reach Mary J herself for comment, but I assume it would go something like this, “Snap into a SlimJim…eat me!